I haven’t the heart to admit to Jason that I’ve got 50 more fruit trees arriving this week… heh! That’s a lot of holes to dig. Your husband sounds very handy. Keep him on! Wow you are industrious. I am retired and have only just got my potatoes and spring onions in. You have made me eager to do more. Husbands are wonderful aren’t they(unless they are directing you what to do with YOUR garden nd trimming things that they shouldn’t!!). I have had the pleasure of my husband for 53 years and he s still lovely. He has built me a lovely gazebo (have you got yours yet?) and he has just finished enclosing my new vegie garden to lift t up a bit. Will you be opening your garden to the public or is that a step too far. Best wishes to you and your family,I relaly enjoy your posts and the magazine of course. Husbands are very handy. Mine does seem to think that he has a right to have an opinion in the garden (hopefully I can train him out of that in years to come). I’m still waiting on my gazebo, and my designer hen house (I have ambitions for a rooftop garden of spinach for the chooks), and my sweet pea frame… I’ll definitely open the garden to the public at some point. I just can’t help myself when it comes to taking on ambitious projects! wish I had one of those too – how wonderful it would be and much better than doing it all by myself!!! Does he have a brother – he’d need to be quite a bit older though!! Having been single for most of my 30s, I’m not sure who is more relieved that I found someone to share my life (and garden) with: me or my dad, who used to be my go-to guy for all bulding projects and mad DIY schemes. It’s so darn handy having a chap around to help. Got any useful-looking neighbours?! Can I have him second? I’m 62 now so finding a good one isn’t too easy however I must admit I dont look too often. You’ve obviously found a goodie. Finding a good one at 35 took a bit of effort too! What a bloke! I’ve got one of those, too. My veg garden is in limbo this winter (mind you “the bloke”‘s own one on the nursery is all go). But mine is being removed, holus-bolus and we are establishing high beds, about my waist height. No more bending, only stretching. The work starts in September. Will miss out on some of my brassicas but the white butterfly will be threatening soon after so the spring crops can get going instead. Off to pick up my order from Kings Seeds any day now. What an amazing collection of vegetables you are planting. Will feed all the extended family for sure. Those new beds of yours sound excellent. Last weekend was my first proper gardening workout in months… I have aches where I didn’t even know I had muscles… so I can definitely see the plus side of tall beds. I made the ones in my city garden just the right height for sitting down on. I’ll end up planting way too much, but we’re intending to go to the farmers’ market to sell fresh veg this summer, and I’ve always wanted a stall at the gate. He sounds definately worth marrying! Beautiful big garden with all those straight lines of veges! Am hoping they aren’t now covered with snow! Look forward to more photos as the season progresses. Years ago I remember seeing a photo of Martha Stewart’s picking garden, with row upon row of flowers grown for no other purpose than to cut and bring indoors. I’ve wanted a proper picking garden ever since, and I guess this is my version. It’s so much easier to make a large garden look tidy if it’s all in rows, and it saves the hassle of trying to think of clever plant combinations in advance! PS. It has snowed twice here today. We do have pukekos, but they seem to stay down the bottom of the hill, in the swampy wetland area. Jason says that Gypsy (our older dog) has taught them to keep their distance… or get eaten. I have a feeling rabbits and possums will have a go at the garden later in the season, but hopefully by then our border collie will have learned a few pest control strategies. At the moment he spends most of the day barking at the neighbours’ cows, so we’ve got a bit of work to do on that front! Hey Linda just a thought, it would be lots less work for you if you just charged an entry fee to ogle your beautiful garden and people could pick the produce themselves and you could charge them by the kilo. Am very envious indeed of the size of plot you have to plant up, my whole vege patch is about the size of what you planted on saturday! That’s not a bad idea. By summer the garden around the house should be looking quite lovely too. My long term dream is to have a pick-your-own berry farm at the bottom of the hill, but that might have to wait another year because I didn’t factor in how much a baby disrupts gardening plans! Hey I’m very impressed you have a garden at all with a baby, I didn’t have anything for 2 years when I had my 2 and so think you are doing marvelously! Lynda, I wondered if you were thinking of get growing series 3? I have moved to Pukekawa on a 18 acre lifestyle block and I have got a blank canvas – sort of. I need to get my vegie patch sorted and orchard and wondered if a lifestyle block would be the obvious choice for the next get growing series! Long shot I know, but worth a try! If that is a big ‘no’, can you recommend any landscapers in our area who are more into vegies and fruit than flowers and shrubs? If I had the final say, we’d do a series of Get Growing on how to transform my lifestyle block first! Heh. I’m not sure if another series is in the pipeline or not. 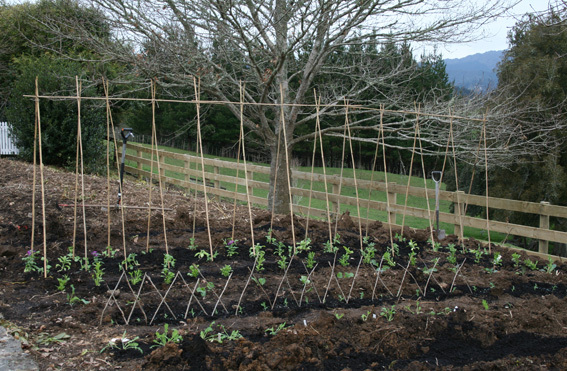 As for landscapers into veges and fruit… go and have a chat to Mandy Villacorte (she’s just past the Tuakau Bridge, heading in your direction). I’m not sure if she does design work but give her a call, 09-232-8433. Hi Lynda. It’s great to read your blog and see the photos of your garden. I read a lot of gardening blogs and I’m always looking for more NZ specific info! I too planted my Jersey Bennes this week. I went out to Bethels beach and collected a whole heap of kelp to put in the trenches and also mulch over the top with. This is a first time experiment – so fingers crossed for a bumper crop! I wonder if you could help out with a question…I sowed Anise Hyssop, Bishops Flower Fern Leaf and Cosmos (all Koanga seeds) on 31 July 2011. I sowed the seeds into a seed tray and covered with about 0.5cm seed raising mix (Dalton’s organic). The tray has been kept in a 3-tier plastic greenhouse that gets sun all morning and until about 2-3pm. I have been watering with a light spray every day. None of these seeds have germinated yet. How much longer should I wait? Did I sow the seeds too early or is it possible the seeds will not germinate at all? Thanks in anticipation for your reply! Flower seeds are far trickier (in my experience) than veges, because they can take so much longer to germinate that it’s easy to give up hope. Don’t worry about yours yet – the cosmos should pop up in the next fortnight (it can take a month to get going). Most spring/summer flower seeds need night temperatures of around 15-16C and it’s nothing like that yet, not even in a plastic house). In future, don’t sow them so deep. Just a light sprinkle of seed-raising mix on top is all they need. Thanks Lynda. One of the cosmos seeds seems to have germinated today, so i’ll just have to be a bit more patient, I suppose. I won’t chuck them out just yet! yes agree best passion fruit ever.